Part Number: CXB000910. Part: Right Side Outer Door Handle (X Power Grey LEF). Condition: Good condition, Fully Tested, item is used so expect the odd wear mark. CityRover Style (MK1 (RD110)) (ABS). TAT71 Arctic Silver. Offside Front Exterior Door Handle. Electric Front Windows/Manual Wing Mirrors. Exterior Colour Code. 5 Door Hatchback. The table below contains further information. CityRover Style (MK1 (RD110)) (ABS). TAT71 Arctic Silver. Nearside Front Exterior Door Handle. Electric Front Windows/Manual Wing Mirrors. Exterior Colour Code. 5 Door Hatchback. The table below contains further information. 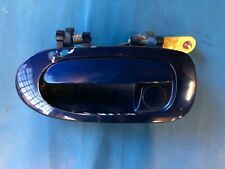 Rover 25 external door handle n/s front from 51 reg. Le mans green, Paint code HFN. Rover 25,MG ZR,1999 on. Checked before removal and OK. Other used Rover parts available. N/S,Left,Passenger side front exterior door handle. CODE - LQW. ROVER 45 / MG ZS Drivers Front Door Handle. WE HAVE THOUSANDS OF PARTS ON THE SHELF READY FOR DISPATCH. Part: Right Side Front Outer Door Handle (CQC Rio Red). Model: Rover 25 // MG ZR. We are a specialist in quality high end new and used motor parts. ALL PARTS HAVE A UNIQUE WATER MARK OR WARRANTY SEAL. All our parts are tested by fully trained engineer, giving the peace of mind when buying a used car part. Part Number: CXB101500XXX. Model: Rover 25 // MG ZR. Genuine Rover part in good used clean condition. Range Rover L322 2002-06, RHD, Front Right Drivers Side Exterior Door Handle, Lock, 7042484, 7042488, 7 042 484. USED, GOOD WORKING ORDER. Part Number: CXB101500XXX. Model: Rover 25 MG ZR. Part: Right Side Front Outer Door Handle (Trophy Yellow FAR). Rover 200 year 2000 passengers side front and rear outer door handle. also fits rover 25. Item: Genuine Rover 25 / Freelander Mk1 NSF or NSR Passenger front or rear exterior door handle x 1. Suitable vehicles: Rover 25 / Freelander Mk1 models with an identical part currently fitted. Parts: Removed from a 2005 reg Rover 25 model we are currently breaking for parts. (Part Number: CXB101530XXX). Part: Left Side Front Outer Door Handle (XPower Grey LEF). Model: Rover 25 MG ZR. Condition: Good condition, Fully Tested, item is used so expect the odd wear mark. Part Number: CXB101530XXX. Part: Left Side Rear Outer Door Handle (Trophy Blue JFV). Model: Rover 25 MG ZR. Condition: Good condition, Fully Tested, item is used so expect the odd wear mark. All our parts are checked they are complete and working before sending. 2002 Rover 45 saloon. Door catch - NSF Left, Front. In good condition , supplied with 3 months warranty. Part Number: CXB101520XXX. Part: Right Side Rear Outer Door Handle (Trophy Blue JFV). Model: Rover 25 MG ZR. Manufacturer Part No : CXB101530XXX. Front Exterior Door Handle. Passenger Left Near Side. Colour: Black. Part Number: CXB101530XXX. Model: Rover 25 MG ZR. Part: Left Side Front Outer Door Handle (Trophy Yellow FAR). Condition: Good condition, Fully Tested, item is used so expect the odd wear mark.